Hard to believe that Christmas will be nothing but a memory in less than one week! Friday night was our company Christmas party, and we had a grand ol’ time. At least I assume we did, though my recollection is a bit hazy. I am no stranger to the boozes, but I don’t usually mix ’em like I did that evening. In my defense, it’s not very often I am handed free drink tickets, so naturally I wanted to take advantage of my employer’s generosity. My final tally for the night: three tequila sodas, a Negroni (gin + vermouth), and a Sazerac (Cognac + absinthe). Is it any wonder my memory’s a blur!? I ordered the Negroni based on Candace’s recommendation, a coworker with whom I share a similar fondness for good food and alcohol, but didn’t care for it that much. I suppose if you’re a fan of bitterness you’ll love it, but I am not, so I did not. The Sazerac, on the other hand? That’s a different story! I was sitting next to Deb’s roommate Jess, and we were sampling each other’s drinks. She ordered the Sazerac first and I liked it so much I ended up getting my own. So if anybody is the bad influence here, it is her. All in all, it was a fun party. My rock ‘n roll boss played two sets with his band, and I even got out on the dance floor for a bit. This part I do remember. We ended up ducking out around 11:30, and only reluctantly, because we were driving north to Bothell the next morning to visit Tara’s family. We ended up leaving around 10:00 Saturday, and Audrey even came with us. It had been a long time since she tagged along, so that was nice. It was snowing when we left – again! – (after another storm last Wednesday that wreaked havoc for Portland commuters), but just flurries. In any case, we enjoyed a scenic drive up to Puget Sound, and spent the afternoon hanging out at Tracy’s apartment. She bought an Atari Flashback gaming system that came pre-loaded with 101 games, so I whiled away the hours playing Frogger, Missile Command, Asteroids, Centipede, and Space Invaders with my nephew, Anthony. So much fun. I was a big Atari fan back in the day and loved my 2600 console. At one point we realized it had gotten dark and we were hungry, so we drove out to the local McMenamin’s tiki bar for dinner and cocktails. 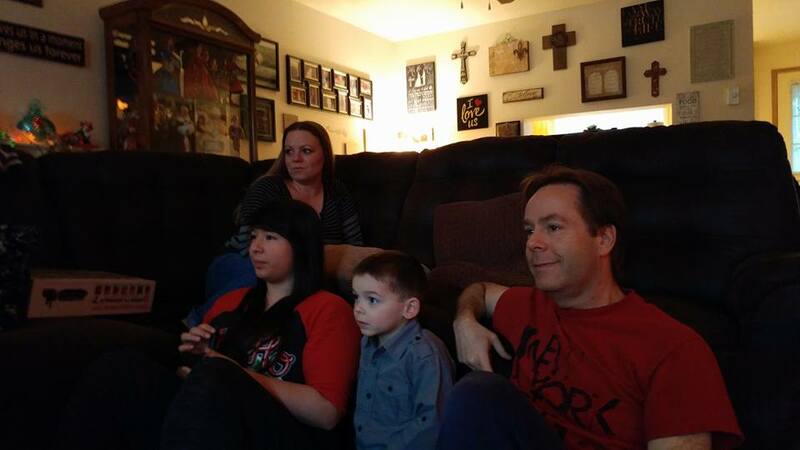 Went back to Tracy’s place and watched Elf before turning in for the night. The next morning she made eggs Benedict, we whipped up Bloody Marys, and opened Christmas gifts early. We left around 1:00, but made a stop in Tacoma at Bass Pro Shops, where I bought a really good quality pair of hiking shoes. I figure this whole hiking thing is more than a passing fad now, so it seemed worthwhile to invest in something sturdy and waterproof. The Keen brand I ended up purchasing was very highly rated. Can’t wait to break them in. This morning I got up early to walk, but had to cut my pre-dawn stroll short because it was 31 degrees and sleeting. I still ended up doing 2.75 miles, but it was getting pretty icy and I was afraid I was going to slip and fall and break something fragile so I decided not to push my luck. We are having quite the winter, and it isn’t even winter yet! For a while there it looked like I would once again be going in late, but the temperature warmed to just above freezing and the sleet turned to rain, so I made the trek to work without issue. It then warmed all the way up to 47 degrees, which feels downright tropical after the cold snap we’ve had. 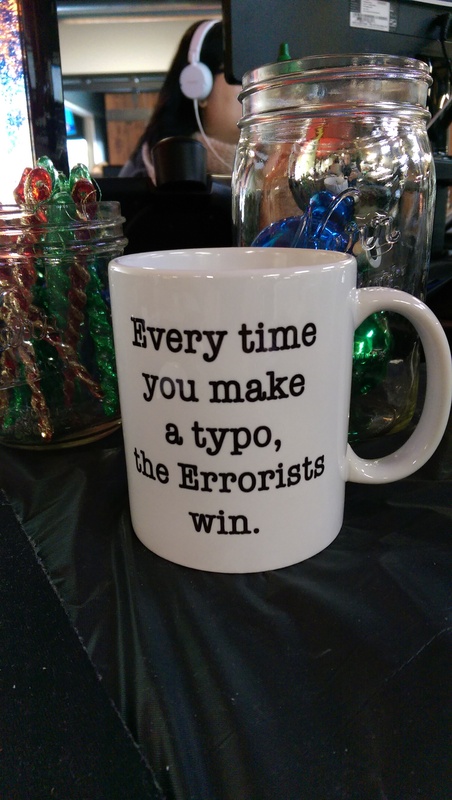 My team surprised me with a Christmas gift this morning that is right up my grammar-loving alley. I, in turn, gave them gift cards to the coffeeshop around the corner. We were just chock full of holiday spirit today. I’ve got three more days of work this week, then I am off for ten. I plan to do a lot of writing over the holiday, as I am anxious to finish my novel and am nearing the home stretch. I could use a pair of hiking boots as well. However, the Echo Dot, not so much. I’m creeped out every time the Google Home commercial plays! Wishing you a very Merry Christmas, Mark. Sounds like a wonderful time was had by all. 🙂 Our Winter Holiday party here at the Library is this afternoon. University Libraries seem to like to plead poverty when it comes to employee parties, yet will spend thousands on new carpets in areas that don’t need them because a few people complained that the sound of high heels on a tile floor is distracting to their work. Ergo, it won’t be as fancy as yours, though they do provide some pretty horrible wine every year, and certainly no gambling. I suspect there will be some simple tunes an a guitar or two as well. Still. It’s a party and we take full advantage of a couple hours off in the middle of our work day to stuff our faces and get little to nothing done after it’s all over. I think it would be pretty cool to work in a library, though. Like you said: a party is a party. Plus: free wine! Horrible though it may be. I hope you provided your team with similarly awesome gifts because that mug is OUTSTANDING! They loved their free coffee. And since this shop only charges us $1, if they are judicial they can make that gift card last for a few months! Good luck with your Christmas Card challenge. Sounds like you’re on the right track to winning. Hope you and your family have a great Christmas! Mark, sounds like you had a FAAAAAAAAABULOUS time at your works’ Christmas party! How festive! And I laughed out loud at the coffee mug your team gave you. HILARIOUS! The weather here has been somewhat the same as you. We had some REALLY cold days, but then last weekend it suddenly turned the other way, the low temps went up to 65 degrees! However, this week (so far) has been my kind of weather – we had some days and nights that were 40 during the day and in the TEENS at night! LOVE. IT.! Wishing you and Tara a VERY Merry Christmas! Thank you, Ron. Merry Christmas to you, as well! Any chance of a white Christmas out that way? It’s looking pretty unlikely here, but then again, it’s super rare for us anyway. Enjoy the holiday weekend!